More Weapons, clever Damage Scaling, improved Visuals, DLC Support and leveled Lists. With PerMa, SPERG, Requiem and SkyRe Compatibility. Please ask permission from the original Creators, if you want to redistribute this in any way or form. No Permission required if you want to release you own Rebalance .esps from Version 1.4 onward. 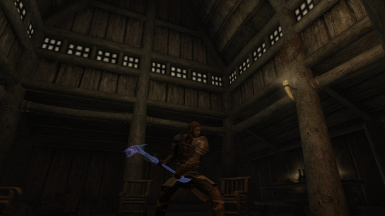 Aertyr fist came up with the Idea for the Damage Scaling by Magicka and Conjuration. I am glad he gave me Permission to use his Mod as a Base. This mod simply wouldn't exist without his Work. PrivateEye for his Heavy Armor Meshes and allowing me to incorporate them. 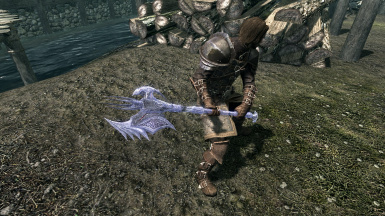 I love how his Mod adds so many different Kinds of Weapons to the Game, incorporates them seamlessly and stays true to the Look of the Game at all Times. DJjojo, thank you for letting me use your Crossbow Meshes. 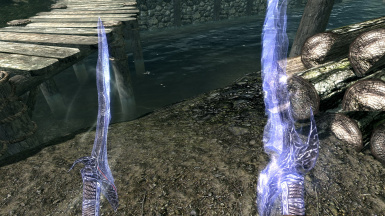 Seriously, only 2 different ones in Dawnguard. What were you thinking Bethesda? They probably were thingking: "You know what? the Modding Community has creative Guys that will come up with much better Ideas for Crossbow Design than we would." They were right. 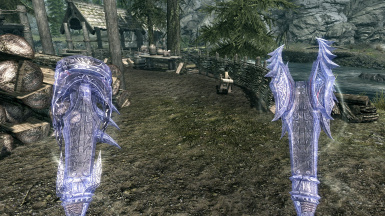 Glowing Daedric Crossbows look sick! In a healthy way... You know what i mean (See Image Section). ElfPuncher and VonWarr deserve a honorable Mention. ElfPuncher's Bound Crossbows has a glowing Weapon and VonWarr's Bound Weapons for all has transparent Weapons. Taking a close Look at their Meshes i was able to figure out how to do it myself and now you can enjoy glowing, transparent Weapons. Custom Bound Weapons had their Blood Layer removed. They now behave like vanilla Bound Weapons, in that Blood will not stick to them. Fixed a bug where Bound Versions of the Heavy Armory Weapons would appear in your Inventory after the Spell ends. For the full story see the sticky post in the comments section. Bound Armory Extravaganza will be the version to receive updates and an SSE version going forward. Bound War Axes, Maces, Greatswords, Warhammers, Pickaxes and Woodcutter's Axes. 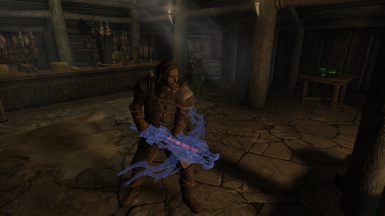 A Bound Crossbow has been incorporated using DJjojo's Daedric Model from Crossbow Basic Collection. The Version without the Armguard has been used, to reduce clipping Issues with bulky Custom Armor Mods. Bound Clubs, Glaives, Halberds, Hatchets, Mauls, Shortspears, Shortswords and Quarterstaffs. A light Version is available for People who don't use Heavy Armory and/or wish to not have these as Bound Weapons. Versions that contain Weapons with SkyRe or Requiem Stats are also available for Download. 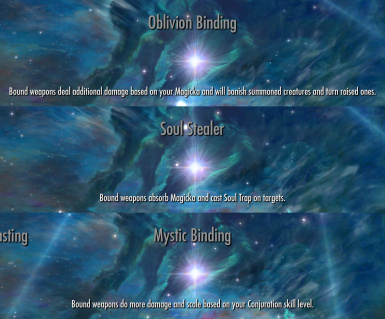 Bound Weapons gain 10% of your Conjuration Skill Level as Bonus Damage. This Damage is Physical, stacks with Weapon Perks and Skill Level and is reduced by Enemy Armor Rating. Bound Weapons steal 10 Magicka per Hit. This comes in handy with the Bonus from Oblivion Binding. 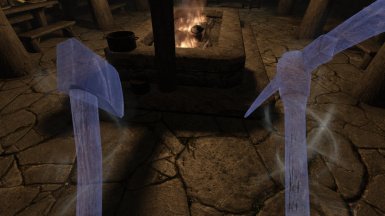 Bound Weapons gain 1% of your current Magicka as Bonus Damage per Conjuration Mastery and Dual Casting Perk (That is: With Conjuration Dual Casting, Novice, Apprentice, Adept, Expert and Master Conjuration you gain 7% of your current Magicka as Bonus Damage). This Damage is Physical, stacks with Melee Perks (but not Skills) and is reduced by Enemy Armor Rating. Rebalance Plugins with different Damage Scaling can additionally be installed. They are compatible with any Modder's Bound Weapons, that will make use of the new Bound Armory Compatibility System. On Top of that, Modders are encouraged to release their own Rebalance Plugins with any Damage Scaling imaginable. Omnigma has kindly provided a SPERG compatible Version. It is now distibuted as a Rebalance Plugin and extends SPERG Bound Weapon Damage to all Weapons found in Bound Armory. A Rebalance Plugin was released by Obl1vion. It uses the Main Bound Armory Damage Scaling and adds Elemental Enchantments to the Bound Weapons. 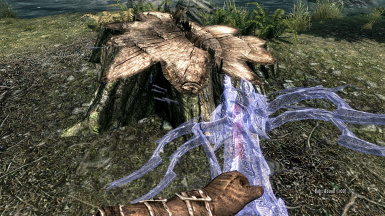 But here is the Twist: the Enchantment is only active, when you summon an Atronach of the same elemental Type. You can download it here: Elemental Binding - Bound Weapons Enhancement. 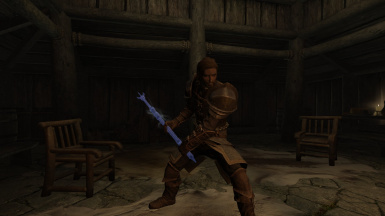 GaigeTheMechromancer released a mod, that is also a Rebalance Plugin: Enchant Bound Weapons. With it Bound Weapons will receive an (or better yet: up to 4) elemental enchantment, if you are wearing the right jewelry, which you can craft yourself. A Rebalance Plugin can be downloaded under the update Files, that removes all Damage Scaling. This Way you get to enjoy all the new Weapon Types even if you do not want additional Damage Boosts. 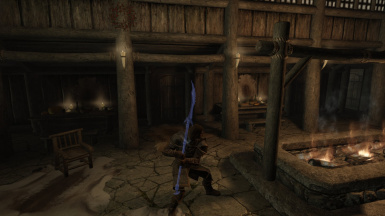 Furthermore a Plugin is available that gives you the classic Damage Scaling from Bound Weapons Redux (Similar to Bound Armory but with a flat 6% Magicka Bonus from Oblivion Binding and no Damage Scaling based on Weapon Skills and Perks). If you do enjoy the Bound Armory Visuals and wish to get the same Look for the Vanilla Weapons, optional Plugins can be found in the Misc Section. They are compatible with all Rebalance Plugins irregardless of Load Order. It is not compatible with the SkyRe or Requiem Version though (yay for SPERG Users i guess :-P). There is also an optional Plugin that changes the Crossbow Visuals to those from the Steel Crossbow. 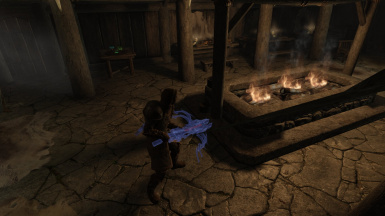 Visuals have been improved to match vanilla bound Weapons as close as possible: All Bound Weapons are 40% transparent and have an inner blue Glow on top of their blue Effect Shader. All Spellbooks are now propperly distributed through leveled Lists (Bound Weapon Redux had them stashed in Farengar's Library). Don't forget to use Wrye Bash. 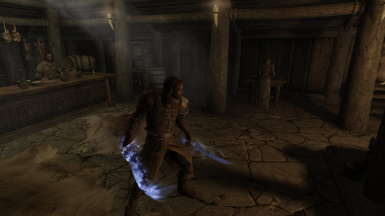 The Bound Dagger from Dragonborn is incorporated into the mainland Skyrim leveled Lists. 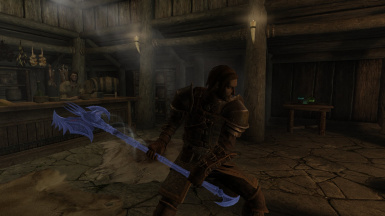 All Melee Weapons have Orcish Damage Values at first and Daedric Values with Mystic Binding. Dragonborn Dagger and Battle Axe have been adjusted accordingly. All Bound Weapons use the Bound Weapon Idle Sound. The Sounds have been lowered in Volume though, to not drive Users crazy. All Bound Weapons now have a magic Sound when you purposfully sheath them (in Vanilla they only have one, when the Spell expires). All USKP Fixes for Bound Weapons have been incorporated. The Bound Crossbow will sometimes not be equipped and stays on the Back. Not sure why, happens with other Bound Crossbow Mods as well. 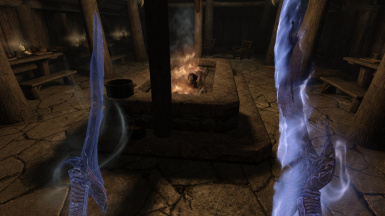 Try summoning another Weapon, preferably Two-Handed before casting Bound Crossbow may help. Or Resting and Recasting. If all else fails, try reloading. This will also happen, when using a vanilla Crossbow Mesh as Bound Weapon. There is probably not much that can be done against this. All custom Weapons first spawn near their sheathed Position, unlike the vanilla Weapons, which spawn directly in Front of you. Requires Dawnguard and Dragonborn. I can make reduced Version upon Request, just leave a Comment or send me a PM. 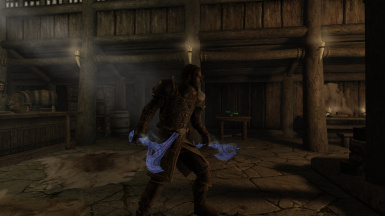 When switching to this Mod from another Bound Weapons Mod you will lose your Spells from the old Mod. Furthermore, if you have a Bound Weapon equipped in your Save Game, this will cause big Trouble. 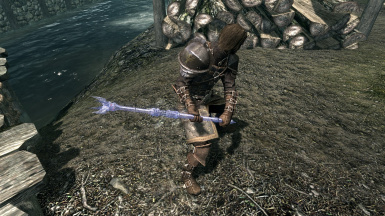 Equip a different Weapon before changing Mods. Feel free to re-add your (updated) Spells via Console Command if you wish. PrivateEye for his Heavy Armory and allowing me to use his Meshes. I love how his Mod adds so many different Kinds of Weapons to the Game, incorporates them seamlessly and stays true to the Look of the Game at all Times. DJjojo, thank you for letting me use your Crossbow. 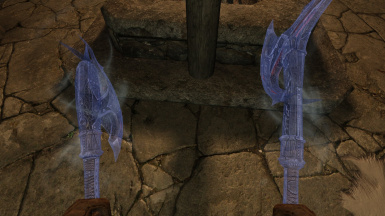 Seriously, only 2 different ones in Dawnguard. What were you thinking Bethesda? They probably were thinking: "You know what? the Modding Community has creative Guys that will come up with much better Ideas for Crossbow Designs than we would." They were right. 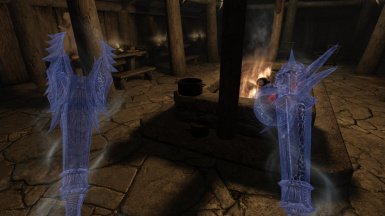 Glowing Daedric Crossbows look sick! In a healthy way... You know what i mean (See Image Section). 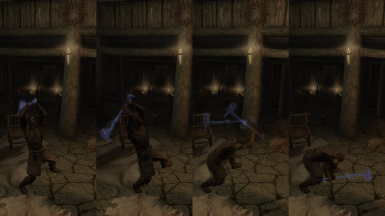 Niklass found a Way to add magic Sheathing Sounds to the Bound Weapons. 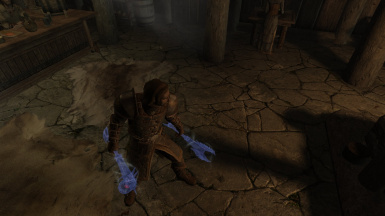 This Mod works well with others, that enhance the Gameplay for High-Magicka Characters such as Mastered Magicka by Ebs01 or Simple Magic Rebalance by myself.If you feel that the one-handed Weapons benefit too much from the extra Damage compared to the slower two-handed Weapons, i have released a Mod called Simple Two-Handed Rebalance for that Purpose.